The cork on a 25 year-old bottle of champagne was just popped. 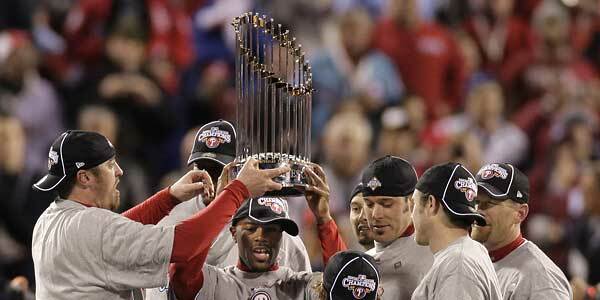 I remember the last time the Phillies won. I was 12 years old, watching the game on the edge of my parents bed. My dad, a nurse, had to work 11 pm to 7 am – and waited as long as he could, but missed the end. I’m sure he heard the commotion on the way to work. Tonight he was the first person I called. Just as it was 28 years ago, he was on his way to work, and waited as long as he could. This time he was able to see that last pitch. With one pitch, the ghosts of over 100 seasons were exised. The weight that the Eagles, Sixers, and Flyers has just been lifted and now they can just play. And I feel so happy for these guys. Those were the guys I remember from the 1980 Phillies. I’ll remember them forever. They come around to Philadelphia, they don’t buy a drink, we all remember them as they were 28 years ago. These guys now have that. Remembered forever. Thank you every much for making a not old, but not young man so happy. And tomorrow I get to remember how this will make the Mets fans feel. This entry was posted in Philadelphia and tagged baseball, Phillies, World Series by Spencer. Bookmark the permalink. Being a bit older than you, Spencer, I remember watching the final game of the 1980 World Series in my Temple U. dorm room…and calling in sick to my internship at WIP (an adult contemporary station then) the next day — so I could parade with other fans the 20 blocks or so down Broad Street to the stadium area. It was a beautiful day — both the weather and the palpable joy…brotherly love, if you will. My dad just called (his ears were burning) — they were at the game last night — he said they “survived” (evidently my 70-year-old mom got a little panicked in the midst of the exuberant crowd on the street.) Still, they are going to be there at tomorrow’s parade, as is my brother and his family. Me, I’ve got a date with a 4th grade class and a Halloween parade. But in spirit, I’ll be on Broad Street. Amazing stuff. The length of time between titles does this make this one particularly sweet. But, I don’t know that I would ever get spoiled. This was cool, wasn’t it? As much as I enjoyed watching the series and the whole season, and loved that they finally won the damn thing, I was starting to cynically think the whole parade thing was useless insanity… but then I was taken in by the emotion of the ceremony at the Park. Especially the part about doing this “again, and again, and again.” What the hell, let’s have a dynasty! How many days ’til pitchers and catchers report?